The Otto is an innovative stainless steel kitchen sink mixer that also features a filtered water outlet. This gives you mains water and purified water from the same mixer saving you valuable bench space. 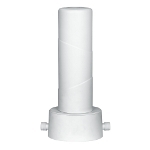 Can be connected to any under-sink drinking water filter or see the SWEDIA under-sink water purifier sold separately. This mixer does NOT include the under-sink drinking water filter. It can be connected to any under-sink water filter or to the SWEDIA water purifer filter which can be purchased separately from here. The SWEDIA Otto is an innovative stainless steel mixer that includes two outlets - one mixer controls standard mains hot and cold water, and the other controls filtered drinking water. The innovative dual outlet nozzle either outputs a fine stream of filtered water from the centre, or temperature controlled mains water through the aerator. This fantastic design means you do not need a separate faucet tap for your filtered drinking water saving you valuable bench space and preserving a minimalist design. Renovator Store sells a matching under-sink ceramic membrane water purifier filter unit separately, or simply connect your existing under-sink unit to the standard inlet. The classic goose-neck styling provides practical simplicity to your kitchen. The refined pencil handles and cushioned feel of the internal ceramic cartridge mixers make it easy to perfectly adjust the water temperature and flow. You will wonder how you ever went without this dual mixer before! Check out the complete SWEDIA™ tapware and drinking water purifier range - exclusive in Australia to Renovator Store!